Oh, Barbican, how do I love thee? Let me count the ways. Stepping inside the walls of the Barbican is to enter another time; a Ballardian built environment of concrete geometry and eerie silence. A future past. A Grade II listed housing estate, built by the City of London Corporation in the ’60s and ’70s, it contains a music school, a school for girls, the Museum of London and the largest performing arts centre in Europe. An idyllic enclave walled in from The City, its self-sufficiency has a post-apocalyptic air. It’d be an ideal location for filming a zombie apocalypse set in the ’70s, and this month it hosted John Cale, performing with airborne drones. 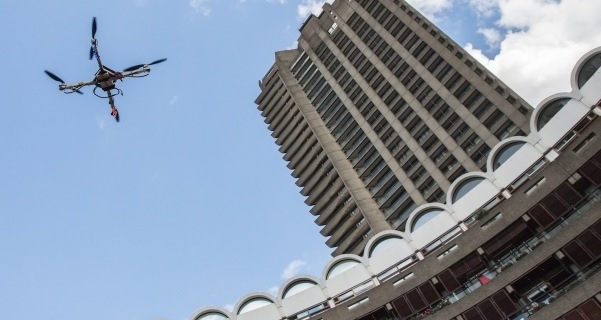 From the vicious angles of its towers, through its warren-like levels and passageways, to the stark central water feature, Barbican is exemplary of Brutalism. The uniform concrete balconies of its small apartments (roughly a quarter mil in today’s market) are incongruously lined with radiantly blooming window boxes; vines and foliage spanning the concrete, like nature reclaiming the ruins of man. Though fraying at the edges, it’s still saturated with a deep glamour of retrofuturism, something like an old Doctor Who set; a gestalt artwork, right down to its light-fittings and vanity mirrors in the bathrooms. Its Gin Joint restaurant is like the high-end mess hall of an old fashioned spaceship. 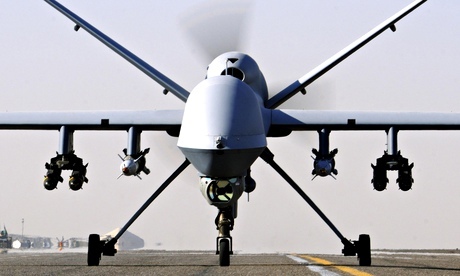 The next era of human warfare can seemingly be summed up with a single word: Drones. UAVs. Unmanned Aerial Vehicles. The US has invested heavily in the new technology – piloted in locations around the world from a small base in Nevada – rendering as it does almost negligible the odds of US casualties in conflict. The UK, similarly, has assembled a drone fleet. 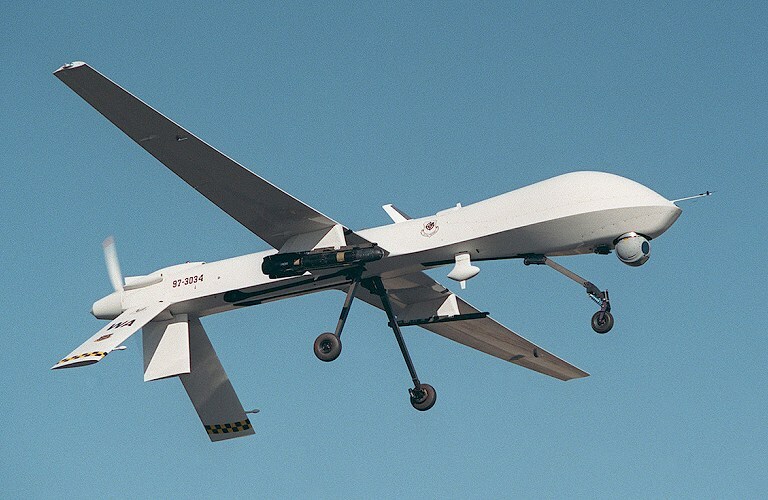 In the 2011 Libyan conflict, the US carried out 145 strikes using its already iconic Predator drone – including a strike that derailed Gaddafi’s fleeing convoy, allowing his capture and execution. Between September 11th and 2012, the CIA was estimated to have killed over 2,000 individuals by drone – with many thought to be civilians. Last year, a congressional hearing illustrated the human cost of the CIA’s routine drone strike policy; the artist James Bridle painted the silhouette of a drone on Brighton prom, to evoke a sense of living under their threat. Brazil bought Israeli drones for use as crowd surveillance during this year’s World Cup. Iran recently claimed to have downed an Israeli drone near a uranium enrichment facility – hundreds of miles within Iran’s borders – and to have reverse-engineered its own drones from a captured American Sentinel. And while the brutal barbarity of Islamic State was once the kind of distant horror that could only provoke what Adam Curtis named ‘Oh dearism’, a Canadian-born member of the organization recently announced (via Twitter) that Western members were helping the group in engineering drones. Even Amazon are readying a fleet. John Cale is no stranger to drones of a different kind. Coming up ‘doing the avant garde bit’ in ’60s New York with La Monte Young, he made his name in The Velvet Underground, giving the likes of ‘Venus In Furs‘ its relentless viola strut. Assembling his first solo record, Cale recorded ‘Wall‘ – an impenetrable, six-minute squall of ceaselessly disorientating viola. Loop>>60Hz – Cale’s collaboration with the futurist designer and storyteller Liam Young – is envisioned not merely as a gig but as a large installation, for the Barbican Centre’s concluding Digital Revolution exhibition. To ensure nothing plummets to the audience’s heads should a drone conk out in midair, the central space of the theatre has had to be enclosed in mesh netting. The hall’s appearance is somewhere between the set of Robot Wars and a nest of giant spiders. As the vast jaw of the stage’s metallic curtain rises to reveal the band – also behind mesh, in Blues Brothers chickenwire fashion – it also draws back, revealing a drop into the orchestra pit. Then, with Cale hunched over guitar, leading his band in a sustained drone, the first mechanical rises from the pit. It’s hard to convey how unusual a sensation it is, as the rotor-propelled shape, strewn with tube lights, ascends through the half light of the hall. Rising, it could almost be an animal – or something suspended from a crane – but then it holds in midair, unsupported, presenting itself: I, Drone. LOOP>>60Hz seeks to confront us with drones face-to-face, and to alter the associations we hold for them. They’re presented almost as lovable – as cheeky pets, mischievous muppets – their shapes varying from a bouquet of flowers, or a bulbous, glowing heart, to strange, semi-animal half-shapes of the subconscious, looming up in the gloom. Cale has been ploughing an unexpectedly purple furrow for the past decade, having returned from classical composition and soundtracks to the three-minute songs of HoboSapiens, blackeAcetate and Shifty Adventures in Nookie Wood. Cale draws from each of these albums for LOOP (as well as his acclaimed Paris 1919 and Music for a New Society). He’s not here to provide a rock and roll soundtrack though. That’s a bass guitar being bowed during the opening drone. Cale’s music often draws a veneer of simple melodicism over the bizarre work taking place beneath – whether in lyrics, rhythms or instrumentation. Here, from behind his keyboard and laptop, he reworks and recasts these songs, dropping us into immersive, squelching, avant-disco funk; an atmosphere of stifling oppression and icy comfort. ‘Afghanistan, Afghanistan, whatever happened to you?’ he asks amidst the nerve-jangling discord of ‘Letter From Abroad’. ‘I don’t really care but I thought I’d ask’. Loop>>60Hz takes us through spoken word passages and apocalyptic bass levels; from the hard boom bap of Cale’s oft-proclaimed hip hop influences to huge, slow waves of sound and that deep, still inescapably Welsh baritone. The absence of a drum kit on stage (albeit with percussion) contributes to the sense of centrelessness, of infinite drifting in the steady state drone. And the drones rise and dance, they sway and loom, the whirr of their propellers offering a basenote to the music. Silent between songs, Cale focuses on contributing sound. As the sinister lope of ‘Caravan’ arrives, he’s fixed in the Malevichian vectors of swaying columns of light, their glow catching on the netting. ‘From now on it’s got to be, a simple case of them or me,’ he intones during a thoroughly retooled version of ‘Half Past France’. ‘If they’re alive, then I am dead’. Except, of course, the drones are not alive, but those usually seeing them would likely die as a result.